Mick Hucknall was given an honorary MSc at UMIST on Wednesday in recognition of his services to the music industry and the city. The talented singer-songwriter leader of Simply Red is one of Manchester's best known musicians. 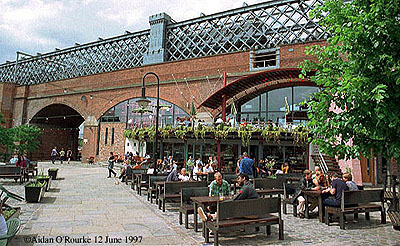 As owner of a stylish waterside pub called Barça, built under a railway arch in Castlefield, and as one of the city's most familiar residents, he has done more than most to enhance the reputation of the city. The degree is his second - he gained a degree in art from Manchester Metropolitan University three years ago. A public enquiry will commence to extend the Metrolink line to Tameside. The process will take about six weeks. A line to Eccles via Salford Quays has already been approved. There will also be connections along re-instated railway lines to Chorlton and Didsbury, but these are still some years off. A link to the Airport is also planned. A pregnant woman, came out of the "Cake Hole" tunnel on Monday, and a further protester emerged on Thursday, leaving only one remaining person under the ground. Apart from a fly poster which appeared on city centre lamp posts entitled "Second Runway Farce" the protesters have been maintaining a low profile this week. Two children and their mother died after an arson attack on their house in Dukinfield on Tuesday. Their next door neighbours, aged 23 and 19 have been arrested and charged with murder. And on Thursday, a 29 year old taxi driver, David Leyland, was killed in a crash involving a stolen car. The twenty-six year old driver of the car, recovering in North Manchester Hospital, was placed under arrest. This was the 10th so-called "joyriding" incident in the last ten weeks. As part of "National Bike Week", the City Council are trying to encourage more people to use bikes to get to work. They organised a challenge on Wednesday, in which cyclists vied against car drivers to reach the city centre first. The cyclists won. The first anniversary of the IRA bomb was spent in a festive mood in Manchester. On Saturday, the Lord Mayor's Parade took place and the city was as usual thronged with people. There was a party atmosphere in Albert Square, and Market Street was packed full of shoppers. This morning, a service took place in Manchester Cathedral to commemorate the bomb. 400 candles were lit, representing the 400 businesses adversely affected by the explosion. The Bishop of Manchester spoke of reconciliation and of the fighting spirit of the people of Manchester. Gordon Burns commenced the discussion by remembering his time as a BBC reporter in his native Belfast. He spoke of his anger at the violence, and the elation felt by people in Belfast during the IRA's 17 month ceasfire. As an adopted Mancunian - he has lived here for the past twenty-five years, he expressed his personal disgust at the Manchester bomb, and invited all present to approve a statement calling on the IRA to declare a permanent ceasefire. The motion was approved unanimously. Mo Mowlem praised the fighting spirit of the people of Manchester, including the Irish community here referring to their pride at being both Irish and Mancunian. She gave an update on the current state of the Northern Ireland peace process, and reaffirmed that the IRA must reinstate a new ceasefire. Councillor Richard Leese spoke of the work done to rebuild the city and help businesses affected by the bomb. Of 670 businesses hit by the explosion, 640 are up and running again. He said that the new Marks and Spencer building will be well under way by the end of the year, and declared in reference to the rebuilding of the Arndale Centre: "no more yellow tiles". It was a lively and good-humoured discussion, though there was evident dissatisfaction among small traders, many of whom spoke out at the meeting, saying the Council wasn't providing them with enough support. Before the meeting ended, other dissenting voices were heard, proving as ever that the Manchester spirit can't be kept down. The weather early in the week was cloudy and warm, but temperatures have fallen in the last few days, which have been drizzly and overcast. It almost feels like winter here, but the rain has held off today.